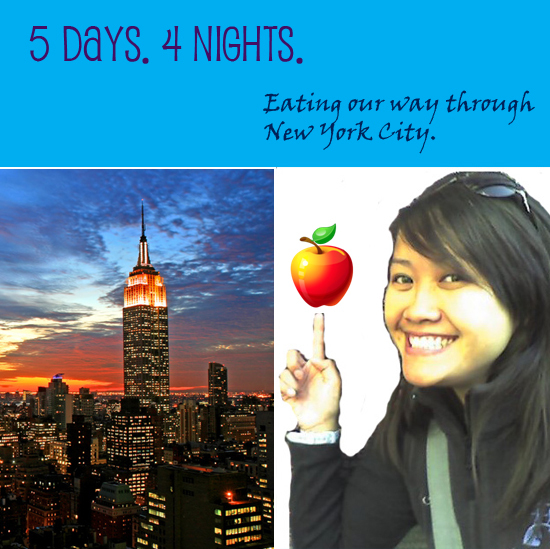 So, to my Foodie Friends….What are your “MUST EAT” spots in the Big Apple???? pizza. especially late at night, after a few midnight cocktails! where? anywhere. for some reason, the small dives on every corner of manhatten does it right every time — for me at least. gooey cheese pizza with some garlic salt sprinkled on top. heavenly. for some reason, the cheese does wonder to absorb all of those adult drinks you intend to indulge in. 6. Shake Shack (Now takes phone orders I think until Feb 28. Otherwise I’ve heard the line is ridiculous. Phone Orders Call 212-889-6600, from 10 a.m. to 8:30 p.m.
okay anonymous…you had me at fresh from the oven, doughnut, pizza, bagels, blah blah blah. it’s a darned shame when i lived in NY, i was too poor and naive to take advantage of all its good eats. Wow, I haven’t heard of any of the places you listed up there! But that’s NY for you right? Great specialty restaurants and shops on every corner, usually only one of its kind in the area, and definitely not enough time (or money…) to explore them all! Have tons of fun, you lucky kids! Definitely have to try Gray Papaya’s hot dogs and papaya smoothie like the others have mentioned. Peter Luger is just okay. Go there for lunch and try their burger instead of steak. But I might be bias about their steak since I am not much of a steak girl. Nobu and Joe’s Shanghai are over-rated. But if you HAVE to go to Joe’s, go to the one in midtown. It’s cleaner and roomier. Thanks for the recommendations Ms.Sunshine! Hope you get the suggestion before you leave! Have fuuuuuun! Be safe, and come back STUFFED! I went to NYC in 2008 and here are some places that I recall. 1) Le Cirque – Awesomeness in every bite. Everything is thought of, from the decor to the service to the food. I was excited to see Top Chef visit the restaurant a couple of years back. Be sure to dress up. 2) Clinton St. Bakery – The best blueberry pancakes I have EVER had. It was so good my brother and I went here twice. Watch out because there tends to be a line waiting for a table. Recently Bobby Flay had a “throwdown” with Clinton St. Bakery and beat them. Now I wanna try Bobby Flay’s pancakes. But this is my golden standard for any pancakes I try. 4) Chikalicious – A small dessert bar. Really small! Only three employees fit in here but they serve gourmet desserts. You can even do a tasting menu at a reasonable price. Sit at the bar to see the chefs work. A really intimate and up-close culinary experience. Desserts are great but I wouldn’t say the best I’ve ever had (except for the creamy cheesecake). If you’re in the area you might want to check it out. Have a great time! Looking forward to your reviews. Whoops. I can’t count. The “4” is supposed to be a “3”. Unless you go to Clinton St. Bakery twice like I did. -Peasant – (nolita) i love the ricotta and bread they serve while you’re waiting for your amazing meal. malloreddus e bottarga pasta is pretty great and the ambience is always cozy. -Clinton Street Baking Co. – (lower east side) it’s pancake month! they’re serving a special pancake mon-fri all day long. i would go when they first open for breakfast, lunch or dinner service to avoid the long wait. oh and get a biscuit and ask for the jam. -Balthazar Bakery – (soho) i would pick up a scone to snack on while shopping in Soho. -Taim – (west village) the fries are salty and freaking amazing. conveniently served in a brown paper bag so you can walk around with them. also great dipping sauce. falafel also great if you want a full meal. not really the relax and sit down type place as it is the size of a walk in closet.